Monster yarn is not to be confused with a yarn monster. 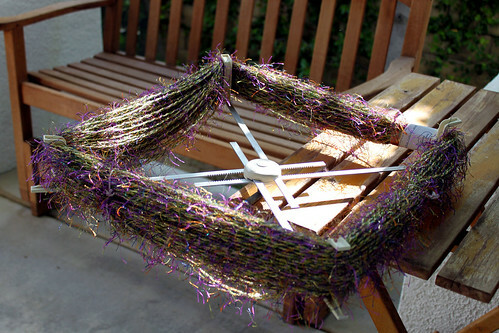 A yarn monster is a huge tangle that has to be undone before the yarn can be used. Monster yarn is that yarn that you bought several years ago that is now so completely out of fashion it scares you to look at it. Since Ria posted on her blog about needing a swift, I thought I would share my really old one. I haven’t seen these around much lately. I always called it a hasp, but the word hasp just means the thing that attaches to the table. Maybe it was called that because to the “C” shaped things on the ends that holds the yarn. I love how small this ‘swift’ folds up. 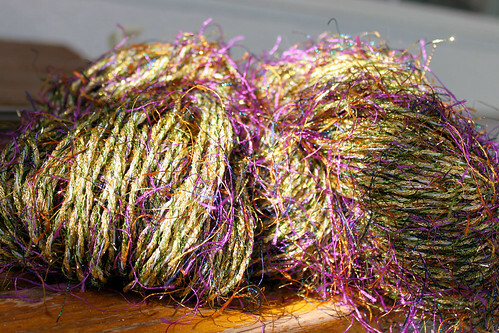 The only yarn I had still in a hank to show on the swift is this monster yarn. I am thinking of putting the skein in the attic for 30 years, maybe by then it will be considered retro and in fashion again. 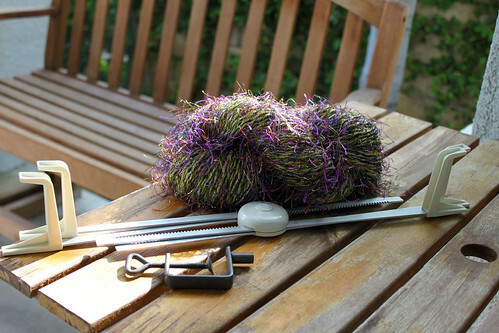 This entry was posted on Monday, May 18th, 2009 at 3:00 am and is filed under Knitting. Tagged: Knitting. You can feed this entry. You can leave a response, or trackback from your own site.